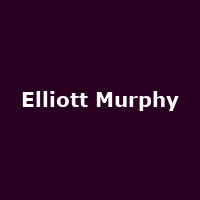 Elliott James Murphy is an American singer-songwriter, producer, journalist and author who rose to fame with his debut album, "Aquashow" in 1973. Other albums include "Lost Generation" (1975), "Night Lights" (1976), "Just a Story from America" (1977), "Affairs" (1980), "Murph the Surf" (1982), "Party girls / Broken Poets" (1984), "Milwaukee" (1985), "Change Will Come" (1987), "Aprés le déluge" (1987), "12" (1990), "If Poets Were Kings" (1992), "Paris/New York" (1993), "Selling the Gold" (1995), "Beauregard" (1998), "Rainy Season" (2000), "La terre commune" (2001 - with Iain Matthews), "Soul Surfing" (2002), "Soul Surfing - the Next Wave EP" (2002), "Strings of the Storm" (2003), "Murphy Gets Muddy CD/DVD" (2005), "Coming Home Again" (2007), "Notes from the Underground" (2008), "Elliott Murphy" (2011), "It Takes A Worried Man" (2013), "Intime" (2014) and 2015's "Aquashow deconstructed". Elliot, a long-time Paris resident, was awarded the "Chevalier des Arts et Lettres" by the French Minister of Culture in 2015.